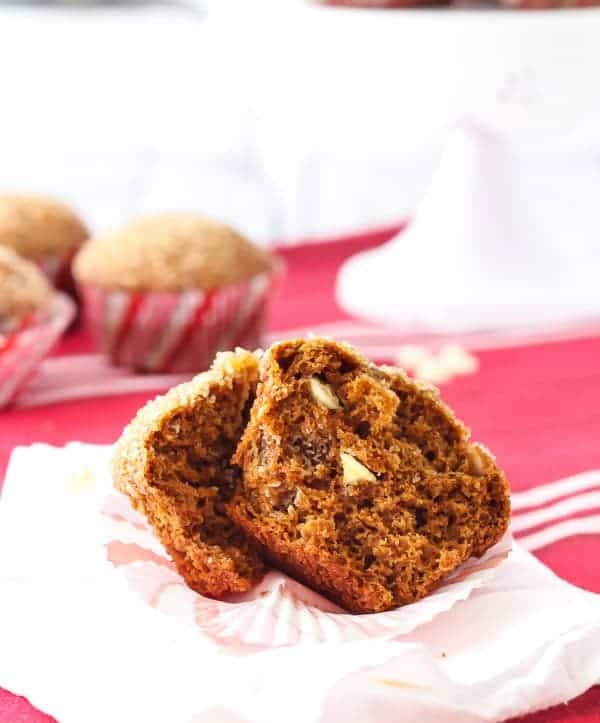 Gingerbread Muffins with White Chocolate Chips are perfect for Christmas morning or any other morning. 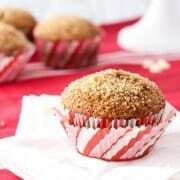 The crunchy sugar topping makes them completely irresistible. Remember how I talked about baking bread for my family members to give them at our early Christmas party? Well, I landed on a beautiful cinnamon swirl quick bread. I had three smallish foil loaf tins so I figured one batch wouldn’t be enough. I doubled the batch and like a dunce, filled the pans nearly to the brim. I knew I was making a mistake but I guess I was hoping for a Christmas miracle – that they wouldn’t bake over the edges. I’m not completely näive, so I did put them all on a foil-rimmed baking sheet to help with any messes that might would happen. Truthfully, I’m not sure why I filled them so full. Lazy, probably. They smelled amazing while they were baking, even though they were overflowing onto the sheet pan. I was so disappointed that I made a stupid mistake, but the house smelled absolutely phenomenal while they were baking. I told Ben that if nothing else, at least they made the house smell good. I think that’s truly one of the best parts of any baking, but especially holiday baking. 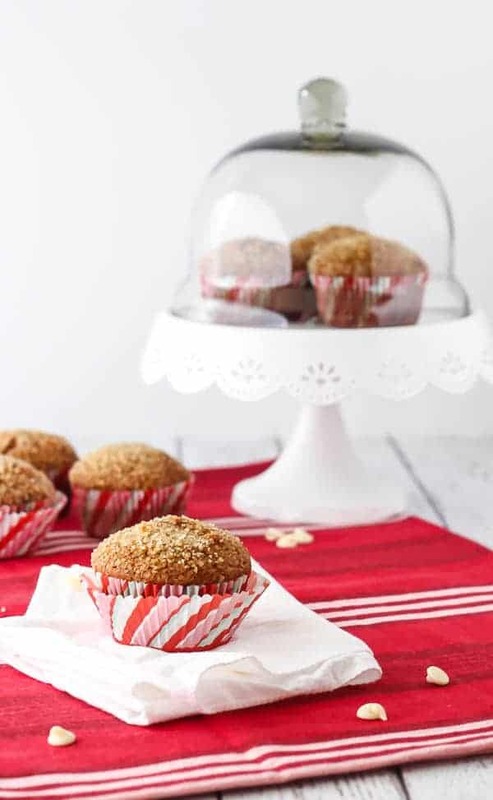 These gingerbread muffins with white chocolate chips are no exception. The warm scents of the cinnamon, cloves, ginger and molasses are undeniably cheerful. 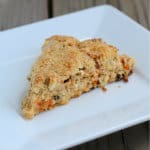 I teamed up with In The Raw® again for this recipe. For these gingerbread muffins with white chocolate chips, I used their I used Sugar In The Raw. 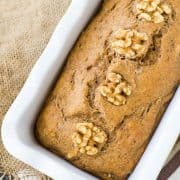 It comes in a 2 pound bag or box (depending on where you are geographically) and is perfect to have on hand for baking. I hardly ever make muffins without sprinkling a good dose of turbinado sugar on the tops prior to throwing them in the oven. 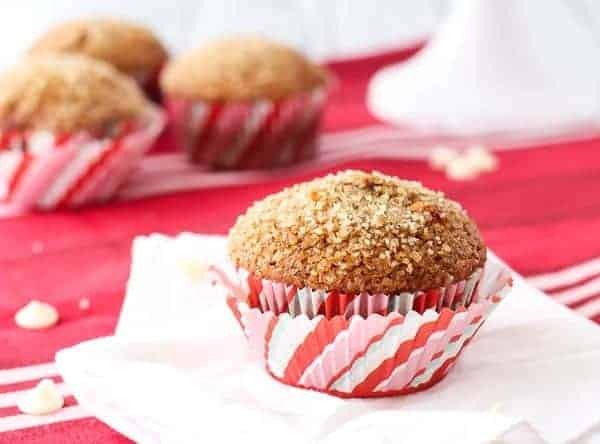 It gives the muffins an irresistibly crunchy top. Basically the best thing ever. Besides popcorn. Preheat oven to 400 degrees Fahrenheit. Line 12 muffin cups with paper liners. In a large bowl, beat egg. Add brown sugar, molasses, milk, applesauce, oil, and vanilla. Whisk until combined. Add flour, baking powder, ginger, cinnamon, salt, baking soda, and cloves. Stir all ingredients together until combined, but do not overmix. Fold in white chocolate chips. Divide evenly into prepared muffins tins. Sprinkle generously with Sugar In The Raw Turbinado Cane Sugar. Bake for 15-16 minutes or until a toothpick inserted into one of the muffins comes out clean. Verdict: I love the spicy gingerbread flavor of these paired with the sweet, creamy white chocolate. The crunchy top is the best part though. 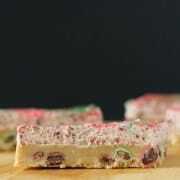 Husband’s take: Gingerbread isn’t his favorite so he wasn’t head-over-heels about these, but the kids loved them. I also sent a plate off with one of Ben’s coworkers and we got a text later that their whole family approved. 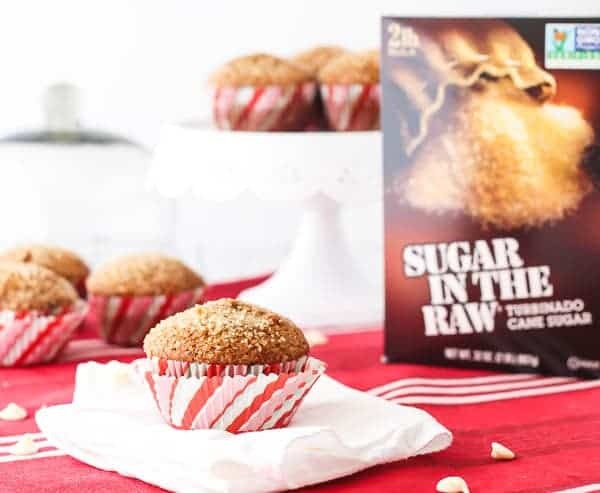 Find out where to buy Sugar In The Raw® here. And make sure to grab some coupons! Make sure to also visit In The Raw sweeteners on their website as well as Facebook,Twitter, Pinterest, and YouTube. 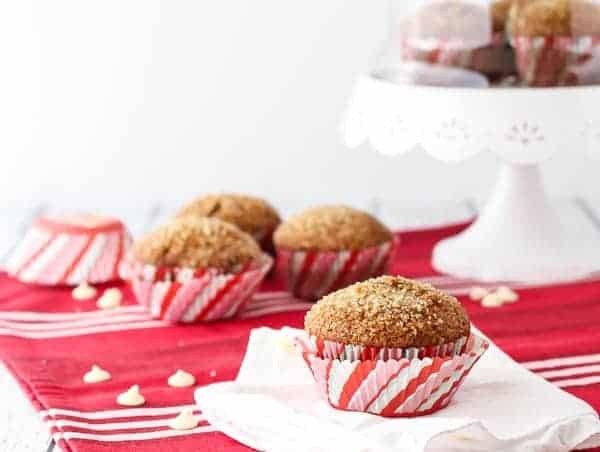 The sugar topping and white chocolate chips make these worthy of a holiday breakfast—but I’d be happy to indulge anytime!